Sam launches an attack on Giganto. 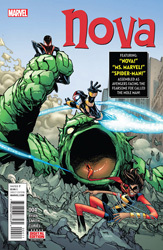 His fellow Avengers, Ms. Marvel and Spider-Man, attempt to tell Nova to work with them as a team. But Sam isn't listening and continues his fight solo. Watching nearby, the Mole Man talks with one of his Moloids. The little creature is attempting to convince his master of something but the Mole Man won't listen. Back at the battle site, Spider-Man's spider-sense is going off. He looks up to see Giganto crashing into the wall after being blasted by Nova. The impact causes the wall to collapse and nearly crushes the heroes! Afterwards, Nova walks over and helps the fallen Mole Man. The leader of the Moloids informs the young hero that his son is trying to destroy him for unknown reasons. Feeling anger over the father and son situation, Nova flies off to confront the Mole Man's son. Suddenly, two missiles come flying towards him! The impact only knocks Sam down and he tells his attackers that it will take more than that to stop him. The angry teen launches himself into a large crowd of subterranean creatures! However, the overwhelming number of creatures finally capture Nova and take him to their master. Sam Alexander finds himself facing the Mole Man's son Mole Monster! Sam attempts to understand why a son would hate and attack his father. The Mole Monster explains that his father's obsession with the surface world caused him to abandon his family. The Mole Man's son is determined to destroy the Mole Man and lead Subterranea to glory. Nova continues his attempt to reconcile the father and son. The Mole Monster refuses to listen and begins taunting Sam about his own father. The taunts cause Nova to explode in rage and blasts himself free! Nova unleashes blasts at the Moloids and heads straight for the Mole Monster. Before he can reach him, Sam is brought down by a Moloid's weapon. As he is brought back to the creature's master, Nova is snatched from behind by Spider-Man's webbing. In a safer part of Subterranea, the three Avengers discuss their next action. Nova strongly believes they should get back into the fight with Mole Monster. Ms. Marvel and Spider-Man disagree and convince Sam that they need to go back to Captain America and figure out their next move. Once above ground, Nova realizes how late it is and immediately takes off into the sky. When he arrives back home in Carefree, Sam sadly realizes that he is too late. His mom has left a note saying that she had to go to a job interview and his sister Kaelynn is at the neighbor's house. In his room, Sam angrily lashes out at the Nova helmet claiming it has ruined his life.